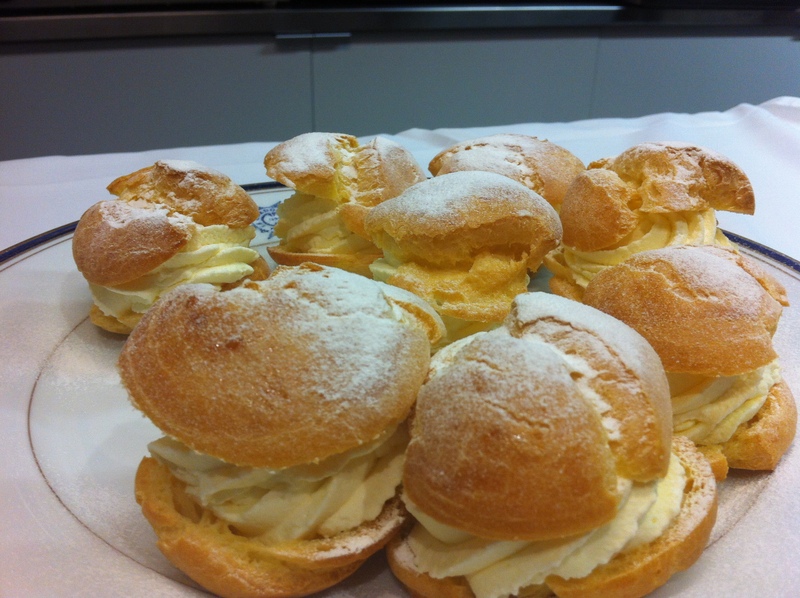 You don’t need to go to the gym if you’re making choux pastry – that is provided you don’t eat the end result. It’s a serious work out when you do it the Cordon Bleu way, which is by hand, beating in six eggs one at a time until you get a glossy pastry. Having a bit of a sweet tooth, I am no stranger to the delights of cream puffs and eclairs but there’s a world of difference between the uneven pockets of lusciousness I make at home compared to what is expected here. I have to pipe three different sized profiteroles filled with creme Chantilly and one lot of eclairs filled with creme patissiere and topped with flavoured fondant. Now fondant is tricky stuff. It has to be just the right consistency. You have to heat it a little. If you don’t heat it enough, it’ll be too thick and if you heat it too much it will lose its gloss. 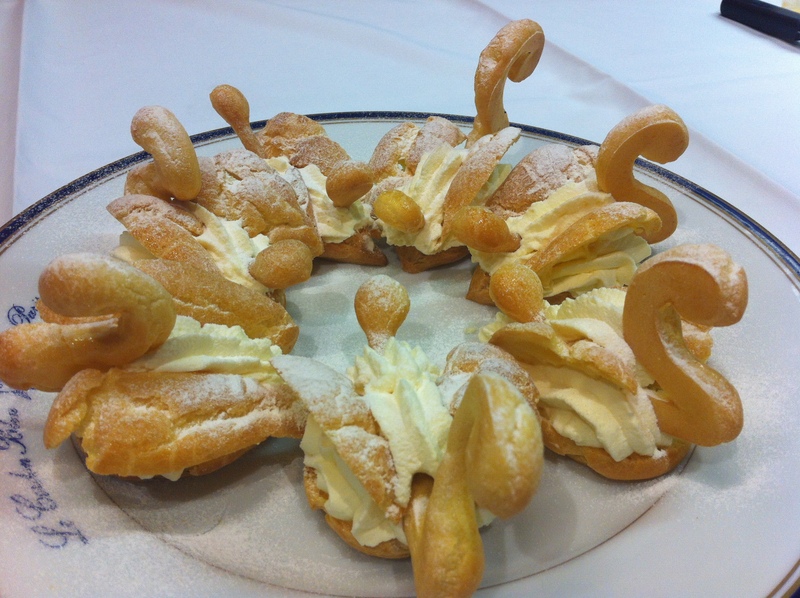 And, if we have time, we can try and make a pastry swan like Chef’s. 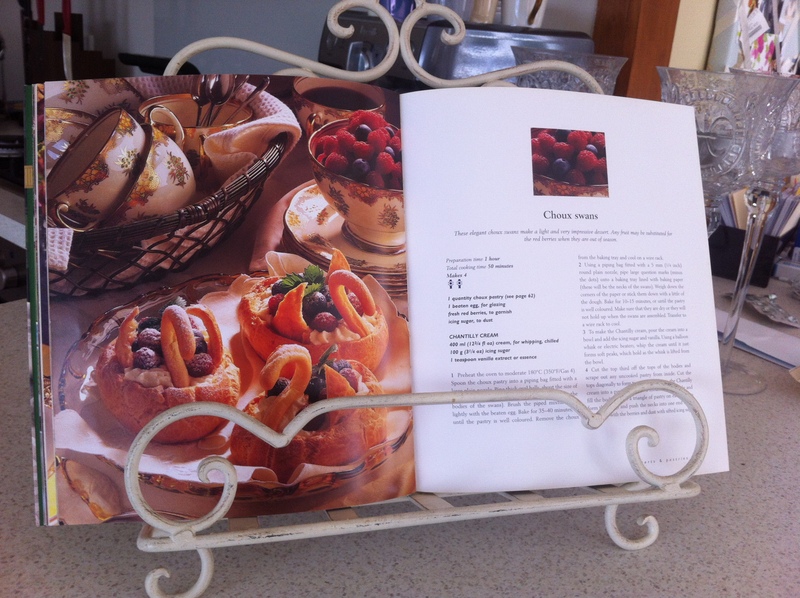 I have seen the swans in pastry shops and in my Le Cordon Bleu Pastry cookbook. I marvel at the skill required so I have to give it a go. Of course Chef makes it look so easy. Mine looks much more like a duck. It clearly takes lots of practice to produce something even remotely similar to Chef’s although several of my classmates achieve it. The sweet choux pastry delights are supposed to be the centre piece but to me they are completely overshadowed by Chef’s Pommes Dauphine. They’re a little extra he whips up for us. I have never heard of them which is really surprising because I thought I was au fait with all things deep fried. They are really really really good. The batter is a mixture of choux pastry and sieved potato. They are thick and crispy on the outside and soft in the middle. I feel blessed to own a deep fryer. And as for my choux pastry, it is okay. The shape isn’t great, I haven’t cooked the creme patissiere enough and the fondant is too thick. But the creme Chantilly is a triumph. Chef’s scoops out some for a taste. He smiles and dives back in for more. Mmm a delicious post! Thank you for your diligent reporting Heather, its so much easier than actually being there, just wish you could beam up some samples. I’m enjoying reading about the different culinary skills required this time around. Thanks Sue, It took me a while to get back into the swing of things but I am on a roll now.